Wow! The summer is just flying past me! Is it just me or is your summer flying past you as well? I have been busy but I still want to enjoy my summer. That, of course, means that I need some down time and that is exactly what I am going to be doing in August. To that end, there will be no newsletter for the month of August. But please feel free to log in and surf all the past articles. Consider it a refresher course! I have been writing articles, knitting for my grands, working and teaching – busy, busy, busy!! I hope you have all been enjoying a lovely summer and good health. Before you know it, school will be starting again and Fall will be lurking just around the corner. 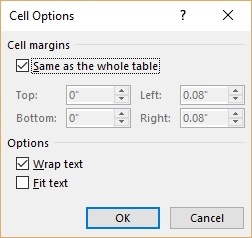 There is an weird feature in Word that will allow you to force text to fit within a single line of a table’s cell. It does this by decreasing the apparent size of the text so that everything fits. Supposedly (according to some Microsoft sources) without changing the actual font size of your text. It really makes no matter though since the size of your text is changed both on your screen and in your printed document. It may be a bit more truthful to state that while the height of the text used is not changed, the width is. Select the cell or cells that you would like to format. If you want to format only a single cell, just be certain your cursor is within that cell. Make certain the Layout tab of your Ribbon is displayed. Click the small icon at the bottom-right corner of the Cell Size group, to display the Table Properties dialog box, with the Cell tab selected. Click on Options , to display the Cell Options dialog box. Be certain the Fit Text check box is selected. 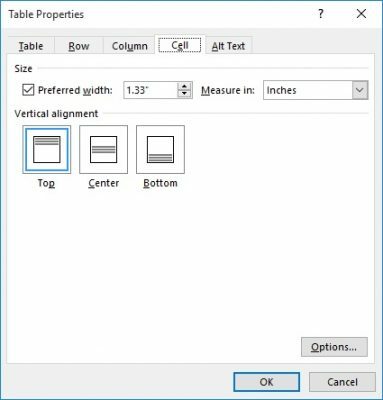 Click OK again to close the Table Properties dialog box. If there is not enough text in a cell to fit all the way across the cell, Word will force the text to fit. This means it will increase the spaces between words and characters to fill the cell. It will not, however, widen the actual characters that make up the cell contents. Word apparently only makes characters narrower, not wider, or so I am told. Subscribers: What To Do When One Change, Changes Everything in Word! Blank Pages At the End of your Word Documents? I have had many folks write to me complaining that when they print their document, there are one or two blank pages at the end of the document. To delete those empty paragraphs, you can simply click Ctrl+End to go to the end of your document. You can then click your Backspace key until you have deleted all non-printing characters (i.e., empty paragraphs). You can tell when you are finished by the position of your cursor. If it is located next to the last character you want printed in your document, you are finished deleting. However, if you would like to see those pesky empty paragraphs that are at the end of your document—before you delete them — simply click Show/Hide on the Home tab of your Ribbon; it looks like a backwards P and is called a Pilcrow. Once you have enabled that feature, you will see all the spaces, paragraphs, tabs, and other non-printing characters in your document—all the characters that normally do not appear on your screen. This can be very helpful for figuring out why something doesn’t look quite right in your document, which is why I always advise my clients to always have this feature enabled. There is one caveat! If the last part of your document is a table, you will not be able to delete the last paragraph right after your table because Word requires a paragraph mark at the very end of any document. It is not out of the ordinary to need to enter a series of numbers within a range of worksheet cells. For example, you may need to enter a series of numbers in the first ten columns of a certain row, or you may have a need to enter information just in a range of ten cells in a particular column. To sequentially enter information in a range of cells, you should always first select your cells. You will notice that Excel will leave the top-left cell in the range as the input cell (it appears white and outlined). The rest of the cells in the range are shaded, to show that they have been selected. Now all you need do is start entering your numbers. When you do, the value you keyed in is entered into the input cell. When you click Enter at the end of the value, Excel will save the value and move the input cell to the next cell in the selected range. Excel will move the input cell either left to right, top to bottom or top to bottom, left to right.